Get Thanksgiving dinner out of the way fast so you can eat the stuff you actually like – the desserts! This clever parfait layers traditional holiday dishes in the order they’ll be eaten, and with portion sizes small enough to please the most finicky dieter. It’s also a space and dish-saver for large families having dinner in small houses. Heat the frozen dinners and/or dinner fixin’s according to directions. A spoonful or two of cranberry sauce – necessary to transition between the savory flavors of the main course and the sweet flavors of dessert. Mashed potatoes, green beans, or macaroni and cheese, depending on the contents of the frozen dinner. 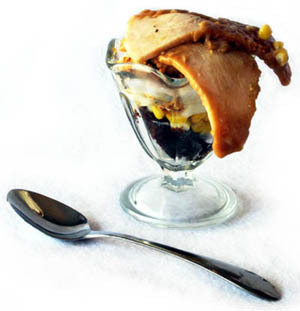 Garnish with a whole cranberry or a few kernels of canned corn. Serve with spoon, paper towel napkin, and a big smile.